You can live a happier life. One that is consonant with your own personality type. We all want to live a happy life. But most of the time we look for happiness in the wrong place or take the wrong approach to it. When it comes to happiness, there is really no “one-size-fits-all” recipe that works for everybody. We are all different. What makes someone happy may not be the ideal for another person. This is why this book offers you five different paths to happiness. Why five paths Because according to modern psychology, most people can be fitted into five categories. Because, according to ancient Eastern wisdom, there are five elements that govern the universe. Because the holistic systems that are used for healing, like Traditional Chinese Medicine and Ayurveda, are based on the interaction of five elements in the human body, mind and emotions. The five alternative paths presented to you in this book come from a methodical observation of how the five elements that rule the universe can be translated into practical knowledge and choices for our daily lives. Interestingly, these five elements also correspond to the five main characters or constitutional types of people. They all have different traits and different potentials that rightly understood give you the key to living your life according to your own constitutional emotional structure. 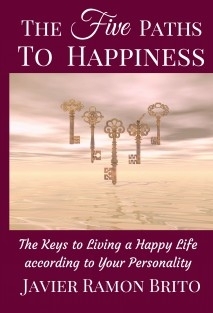 The final chapter on how to increase your happiness dispels the myths that surround the achievement of happiness in our modern society and analyzes the true essence of happiness. It offers a sound alternative to the “rat race” in which many people are trapped. By knowing the five paths and understanding the true essence of happiness, people have a choice. You can be happier and live a happier life. This book shows you how.